Twenty years ago, a thought came to me during a massage therapy session. It floated into my massage studio and would not leave. Once published, the thought kept moving. It turned up here and there: in a couple of books, in an occasional massage school graduation speech, on a massage therapist’s website. Recently, on its 20th anniversary, I decided to write it down again. This time, I wrote it longhand. My writing-it-in-cursive experiment had mixed results. Never legible to start with, my handwriting has deteriorated. Twenty years of keyboards and block printing have booted my cursive to the curb. My little “m’s” have too many arcs, or too few. The page is full of cross-outs. I miss writing in cursive. They don’t teach it much anymore. Cursive-writing is a lost art, going the way of Latin. Some dismiss the loss. Others lament it: They say that without cursive, the next generation of historians will not be able to decipher primary sources, nor hundreds of years of correspondence. That generation gap is already here. With minimal instruction in cursive, my child struggles to read her uncle’s letter to her. She is intrigued by it, though, and tries to copy cursive. She draws straight-up print letters first, then links them together with skinny little arms of ink. She practices her signature. I nod appreciatively. She’ll get by. I imagine her adult self, signing a car loan or writing a letter. She might even issue a government decree one day, in cursive. Maybe we’ll loop back to parchment by then. To me, massage is cursive. That act of wrapping a pen in one’s fingers, then moving it across paper in curves and lines—it is similar to classical Swedish massage. Just remove the pen and ink. Use oil instead. In place of the antique desk and blotter, use a massage table. Change out the paper and bring in a human. A human, with a story, who has asked to be touched. On this massage table, my hands move in loops and spirals. But unlike handwriting, my hands are reading someone’s story, not writing it. My hands regard the story. They interact with it, following it around the curves and corners of the body. This is not pure cursive. It is a different kind of agency, a different kind of story. In the two decades since winter 1999, the massage therapy profession has lived through its own story. Sometimes we’ve written it. Other times, others have written it for us. There’s that age-old conflict, again: Who gets to tell the story? It’s a story of mixed results. Twenty years produced a genuine marketplace for massage therapy, where people can now offer skilled touch and others can ask for it. The internet helped us all find each other. It gave us an inexpensive platform for our message to the masses. Twenty years gave us some sensible regulation and a few new credentials. We published some good research, some of it open-source. We shrugged off a few outdated laws. In that time, the public began to view our work as less like prostitution and more like wellness care, or even health care. In increasing numbers, people started seeking out massage during cancer care, after heart surgery, and in rehab. They sought us out for stress relief. Consumers began to demand massage therapy throughout the life cycle: Pregnant women wanted it. Parents learned massage for their babies. Children asked for it for their dying parents. We appeared in Terminal B, and on inpatient Unit C. We showed up at the music festival, at the fundraiser, at the Olympics, and in the state legislature. We were everywhere. It was a matter of time before people noticed. When they did, they saw opportunity. In a board room somewhere, someone thought to package our work as one of the seven deadly sins. For some reason, that appealed to people, and storefronts multiplied. The model took off and demand grew. In response, massage education boomed. Schools opened, some formed long chains of campuses. They enrolled thousands of students. Educators argued for degree programs, or for graduating in 6 months, or for tiered education. Major publishers scurried to fill the textbook market. Tables, lotion, and other suppliers came out of the woodwork. In droves, MTs bought liability insurance and cheap CE courses. The industry begat more industry. We became as common as bread, and as commodified as car insurance. In the US, enrollment in massage programs leveled off, then dropped. At least a third of schools closed. Some were closed by force, for questionable financial and admissions practices. Others shut their doors because there were too few students. The supply side of massage therapy began to shrink. People left the profession. Fewer people joined it. Employers strained to find therapists to keep up. The promising trajectory faded from view. 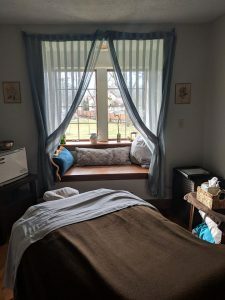 Now, even as demand for massage continues to grow, even as we are cast as part of the solution to the opioid problem, even as we become fixtures in places we used to only dream of visiting, suddenly there aren’t enough of us. This gap is painful. It is ill-timed. One, the income waiting for MT graduates does not typically cover the student loan debt required to become a massage therapist. Two, we’ve stretched income inequality to its breaking point, at least in urban areas. Middle- and upper-class consumers can no longer demand massage therapy when and where they want it, if MTs cannot afford to live anywhere near the demand. Yes, we wanted a seat at the table, but we also need to eat. If MTs cannot provide quality care while safely housing, feeding, and caring for themselves, then current systems of massage therapy delivery are not sustainable. We will be better advocates of massage therapy when we provide for its providers. These provisions could take many forms: stronger education, student debt relief, better compensation, more favorable supports (and fewer penalties) for MT entrepreneurs and microbusinesses, and meaningful third-party reimbursement for massage as health care. Rapid growth is thrilling, but challenging to navigate. Rapid growth does not come with a map or an instruction manual. Many of us are still catching up to the last year, or the last five. With growing interest on the demand side and shrinking interest on the supply side, our landscape is in flux. In the past 20 years, massage therapy has helped a lot of people. Yet massage therapy has not always helped the profession of massage therapy. At times, we’ve had thoughtful leadership and strong collaboration to steady us. Our alphabet soup of professional organizations has given us great hearts, voices, and a long list of accomplishments. At other times, we’ve seen infighting, turf wars, and missed opportunities for the profession. 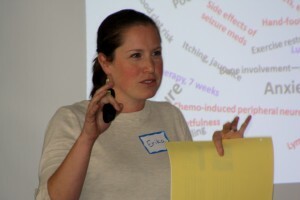 Massage therapy training does not typically include professional advocacy, program development, or leadership skills. These are ingredients in self-determination. In their absence, we are left to rely heavily on external approval and other people’s skills. We are vulnerable to other people’s agendas. Put simply, others get to write our story. Against this landscape, someone brought my 20-year-old thought to my attention. When she nudged me with it, she caught me up short. Sure, I had seen it around. It’s on our website. But I hadn’t read it closely in a long time. Upon doing so, I cringed a little. It was all I could do to keep from editing. Who uses that word anymore? How quaint! I must update this thought, I thought. Instead, I copied it word-for-word into my journal. Now, days later, I am reading it back to myself. As I read, I reflect: Do I still believe this? The words themselves seem to test me. They ask me to reevaluate our work in light of the 20 years of steps and missteps in the profession of massage therapy. They ask me to sit in this season of confusion and ask, Why can’t I tell whether we have moved forward? Is the work fizzling, as it appears, from lack of oxygen? Or is this our moment—the one we anticipated for years—and it just doesn’t look like our moment? In this moment, do my words from 1999 still ring true, or do they remain a quaint, lost artifact from an idealistic time? Am I just longing for our Woodstock, for those days before we were discovered, then branded? Back when our work was pure, misunderstood, and dismissed? Do I still believe these words? The passage sits unevenly on the page. The words wait. They dare. Eventually, my answer comes. It is quiet, but clear. My pen might be clumsy, but my massage hands are sure. They continue to move across my client’s tissues. They continue to ask: What is it like to be in this body? What stories does it tell? They continue to trace a whole life in an hour, in a moment. Many hours later, I have a whole collection of stories. I imagine my hands connecting each data point with the next, like skinny arms linking my child’s upright letters. I believe these connections are bridges. I believe that healing crosses these bridges. Healing crosses in both directions. Now, enough with the cursive. Now, it takes a few moves of the mouse to layer a thought over a picture. It is much easier to read than my blotchy script. My mouse hesitates. It is more than a little odd to quote yourself. Our internet is already stuffed with well-meaning quotations. Some are more useful than others. This one? It is just…true. It has held up over time. 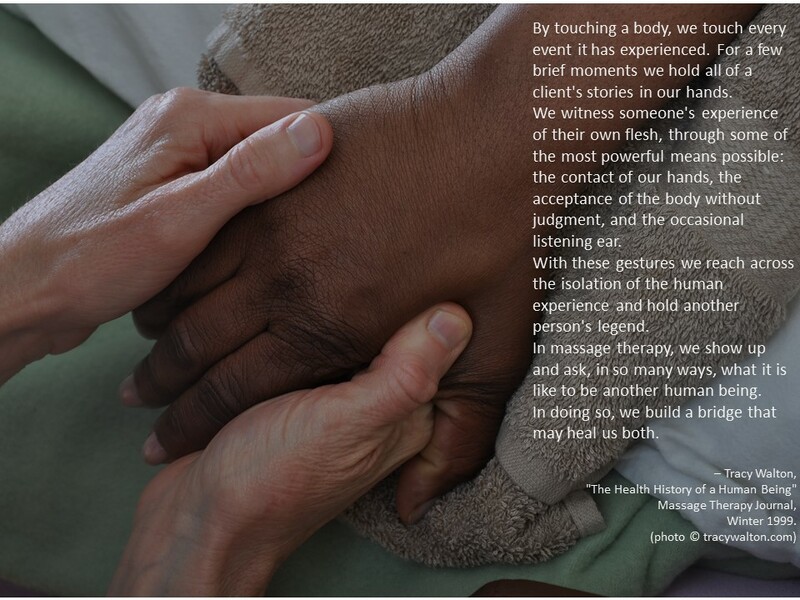 By touching a body, we touch every event it has experienced. For a few brief moments we hold all of a client’s stories in our hands. We witness someone’s experience of their own flesh, through some of the most powerful means possible: the contact of our hands, the acceptance of the body without judgment, and the occasional listening ear. With these gestures we reach across the isolation of the human experience and hold another person’s legend. In massage therapy, we show up and ask, in so many ways, what it is like to be another human being. In doing so, we build a bridge that may heal us both. –Tracy Walton, “The Health History of a Human Being,” Massage Therapy Journal, Winter 1999. Recently, in a group of oncology massage therapists, I started a discussion about setting fees for massage therapy. In this particular group, we were all in private practice. They were all participants in my oncology massage therapy mentorship program, and we were talking about money and pricing. It is a charged topic, this question of what to charge. Massage therapists in private practice are the deciders, but those decisions can be fraught with pressure and confusion. Our conversation went in several directions and plunged through several layers. How high, how low, whether to discount, how to raise fees when it is time. 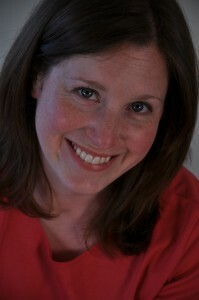 As we talked, we shifted our conversation away from the therapist and toward the therapy. Eventually we did one better and shifted it toward the therapeutic outcomes. By focusing on outcomes rather than our service, or ourselves, we achieve an important separation. Setting fees requires that we separate ourselves from our work. Even though who we are is a part of what we bring to the session, it is liberating to see our service as separate from ourselves. It’s too easy to fall into the trap of “I should charge what I am worth.” I’ve even encountered MTs who ask each client to pay what the client feels the therapist is worth. Deferring to the client for the final word can be problematic, to say the least. But equally troubling is the notion that we charge based on what we are worth. When we do, a simple fee for a simple service becomes gnarled up in self-worth. Add in all the emotional energetics of money and self-esteem, along with the gender wage gap and other social forces, “charging what I’m worth,” is a prescription for confusion. Pile on the intimacy of massage therapy and the therapeutic relationship, and it could take decades to disentangle it all. The Intrinsic Value of a Human Being is not up for Sale. It never was. Each person is perfect and sacred, beyond the language of “value.” Not a single person’s worth is affected by their choice of pricing. Not one person’s worth can ever be captured in a $50 or $80 or $150 hourly fee. No, you’re not for sale. Even the value of your time is not up for debate. So what are you selling? Your solutions are for sale. It’s useful to remember that we work in a service industry. In service industries, we solve problems. We bring expertise and energy to problems that are hard or impossible for people to solve by themselves. I do not know how to shingle a roof or fix blown plumbing. I cannot cut hair well enough for school picture day. When I hire the roofer, the plumber, or the hair stylist, I pay them for their service. Not because they are “worth” something, but because it is worth something to me have those problems solved. Especially the night before picture day. In massage therapy, we would do well to remember our membership in the service industry. It is important to focus on the problems we are known to solve, and those we have the potential to solve. In oncology massage therapy, that list of problems is compelling. People in cancer treatment and post-treatment deal with pain, nausea, fatigue, stress, trauma, insomnia, isolation, poor body image, stigma, anxiety, and depression. Research on oncology massage therapy is still in a tender place, but there is growing research on massage therapy helping the “Big 5” symptoms in cancer care: pain, nausea, fatigue, anxiety, and depression. From that body of research, the strongest support seems to be for pain relief and easing anxiety. More generally (across multiple populations, not just oncology), there is compelling evidence that massage therapy is as helpful as psychotherapy for the problems of anxiety and depression. *** That alone is worth celebrating. Research aside, we have other reasons to promote our work to oncology clients. These reasons come from the clients themselves. Over many years, my clients have told me tangible, intangible, and sometimes surprising benefits that they attribute to massage therapy: That massage helps them sleep. With massage therapy they feel less isolated and stigmatized. Massage helps them feel feel cared for and appreciated. They look forward to pleasurable sensations from massage, after months of needle sticks and scans. They tell me that when they receive regular massage therapy, they feel better able to cope. These benefits are worth money. Our clients’ observations count for a lot. 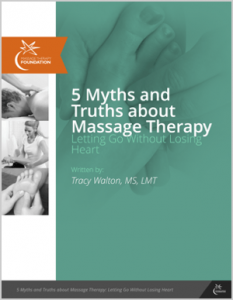 They are telling us why massage matters to them, with or without rafts of research behind them. In addition to the client with cancer, there are others in the circle of care who are helped by our services. Nurses tell us that that massage therapy eases the nursing workload. They notice that when MTs are working with inpatients, the nurses themselves do not have to respond to so many call buttons. This is worth money. Other people’s burdens are also eased by oncology massage therapy: The out-of-state uncle or daughter who purchases a session for a family member. A group of co-workers who finds a meaningful gift in a package of sessions. An exhausted caregiver who gets an hour off while the MT sees their loved one in the home. The cancer rehab PT who works more effectively when a patient’s muscles are already relaxed. These things are worth money. Our clients, client communities, and health care providers tell us that massage is solving problems. With or without research, theirs is an honest truth. Oncology massage therapy has enough of a track record to be well-compensated. We can charge accordingly, without getting ourselves or our self-worth mixed up in it. Oncology massage therapy is well-received. It feels really good. Relaxation is part of the solution. Sometimes it is the entire solution. Zoom out. Look at the field of massage therapy, not just oncology massage therapy. Even massage therapists do not always appreciate the value of basic relaxation massage therapy. Sometimes we search for more powerful techniques, forgetting how highly effective our Swedish massage foundation is. It was amusing to have to be reminded of this, but I loved the simplicity of his endorsement. We’re good at massage. Unadorned, un-fancy, effective massage. When questions of worth enter in, they can confuse matters. Yet all by itself, massage therapy is a compelling service. Our skills are badly needed. We live in a market economy, where services are exchanged for money to solve problems. Our services should be no exception. We can exchange skilled touch for money, because skilled touch solves problems. I have more to say about pricing, and our tendencies to over- and undercharge in some cases. There are sometimes special circumstances in force, or a client’s financial need to consider in pricing. I’ll share those thoughts soon. 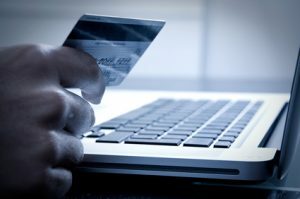 Meanwhile, remember this important starting point: Pricing does not have to be so personal. It is not so much about the problem-solver, or what you, as a therapist or a person are worth. It is more about the results. Disentangling the self from the service can be freeing. A focus on the service can reveal a much clearer perspective, one where difficult problems demand good solutions. With that perspective, we are uniquely equipped to provide good solutions. We can and should be well-compensated for them. 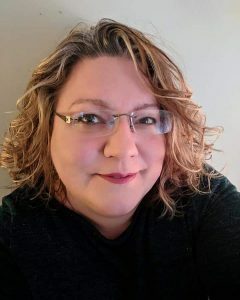 *After I wrote this post, I noticed a Facebook discussion about “charging what you’re worth.” I did not have time to incorporate that discussion here, but if you follow Irene Diamond or Sandy Fritz on Facebook, they tackled this as well. I highly recommend taking a look. 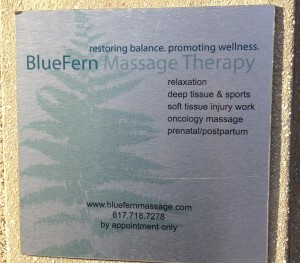 ** Do not get me started on the fuzziness of the term, “deep tissue.” That’s a topic for another post. ***Moyer CA. Rounds J, Hannum JW. A meta-analysis of massage therapy research. Psychol Bull. 2004 Jan;130(1):3-18. Every MT should read it.